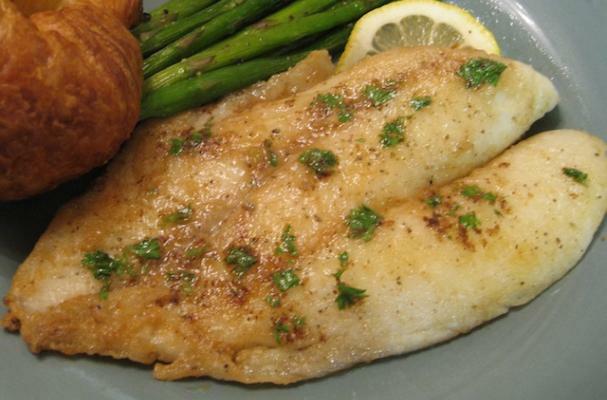 One of Julia Child's favorite dishes, Sole Meunière is a simple, elegant meal -- now, gluten free! Sole is an incredibly filet of fish, thin, mildly flavored and perfectly paired with light citrus sauces. This recipe is incredibly easy and perfect for 2 or 4. Place flour in a wide flat dish. Rinse sole filets and pat dry with paper towels. Sprinkle both sides of the filets with the salt and pepper. Dredge the filets, both sides, in the flour, shaking off the excess and place filets on a platter. Heat the oil in a large skillet over medium-high heat until hot and shimmering. Add butter and quickly swirl the coat the bottom of the skillet - the butter will foam. Once the foam is gone, add the filets and cook until golden brown on the bottom. Carefully flip the filets and cook until opaque and golden on both sides (a minute or two). Divide filets between two plates, tent with foil and keep warm. Pour off the drippings from the pan and wipe out with paper towels. Return the skillet to medium-high heat. Add butter and cook until golden brown. Remove the skillet from heat, stir in the chopped parsley and lemon juice, careful that the butter may sputter. Spoon the sauce over the fish and garnish with lemon wedges. Julia Child was using gluten free flour?